Officials of Borno Police Command today said at least 12 persons died as 18 others were injured in multiple suicide bomb attacks in Maiduguri. Borno State Police Commissioner, Damian Chukwu, stated this while confirming the attack at a news briefing in the state capital today. He said four female suicide bombers were among the dead victims. The commissioner, however, said soldiers deployed to Mammanti and Cimeri areas, foiled an attempt by three other suicide female bombers to penetrate Maiduguri metropolis. He said two of the attackers were intercepted and killed by soldiers at 11:59 p.m., on Sunday, at Mammanti village in Konduga local government area of the state. 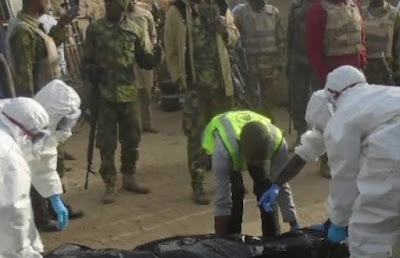 Chukwu said the military also intercepted and killed one suicide bomber who tried to enter Maiduguri at Cimeri area of Mafa local government area. He said the fourth suicide bomber denoted the explosive strapped on her body at a mosque on Monday morning, in London Ciki area of Maiduguri. “The suicide bomber detonated the IED, blew herself up and killed eight persons. “Security operatives have foiled three of the attempted suicide bomb attacks while only one of them carried out the attack and all the four suicide bombers were killed in the attack,’’ the police commissioner added. LONDON CIKI AREA?SHEBI WESTERN EDUCATION IS HARAM,ADOPTING THEIR NAMES SHOULD BE HARAM TOO./KEEP IT UP ALMAJIRIS.KEEP BLOWING UP THAT REGION.YOUR FOOLISHNESS AND BACKWARDNESS IS LEGENDARY.